Ah, it’s that time of year again: sale time! There are some really good bargains this time around, too. Some of my favourite deals can be found in the Debenhams luggage section. I know that doesn’t sound madly exciting, but since we are in the throes of the summer holidays I wanted to flag it up. If you are like me, perhaps you have scoffed at the premium prices commanded for full-price, decent quality suitcases. But you may also, like me, have come unstuck with your luggage choices in the past. Suitcase 1: the wheel fell off. Lugging it around airports was a nightmare. Suitcase 2: the cheap plastic lining, supposed to keep the suitcase rigid and sturdy, shattered. Every time I opened it after a trip, there were brittle pieces of plastic buried in my clothes. Suitcase 3: I should have learned by this point (sigh). Anyway, you know the handle that you pull out of the top of the suitcase to wheel it along? It fell off. All the same, I could sort of wheel the suitcase along – if I was tilted at a funny angle and didn’t mind walking slowly with an acheing back. To make it worse, I was off on a road trip – which meant hauling that dratted suitcase in and out of a different motel every night. Not fun. Please don’t follow my example. These purchases were the mistakes of a tightwad fool. You can tell that I’m still annoyed, years later. Suitcases need to be able to withstand a lot of wear and tear, so it is a shame that decent luggage is so expensive. If you can’t beg, borrow or steal, I am certainly not suggesting that you go and splurge on Samsonite or anything like that. But I am delighted to discover that in the Debenhams summer sale, the price tags on Tripp suitcases have been knocked down by 70 per cent. Tripp luggage is well made. It is sturdy and lightweight – and usually expensive, to go with it. A range of Tripp suitcases and holdalls, in various colours, are going for knockdown prices in the Debenhams final clearance. 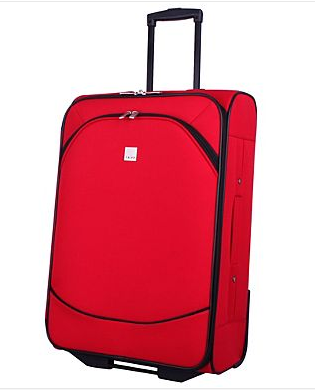 For example this red wheelie suitcase, 62 cm x 43 cm x 23 cm, has been reduced from £140 to £35. Free delivery when you buy online. 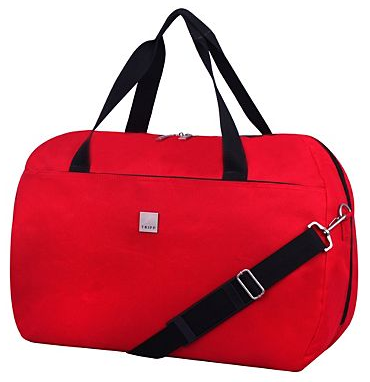 If you want to be super-smart at the airport, you can also pick up this matching holdall, reduced from £85 to £12. Thank you, thank you. I have been to Debenhams and bought the Tripp holdall. Exactly what I needed and at the right price.